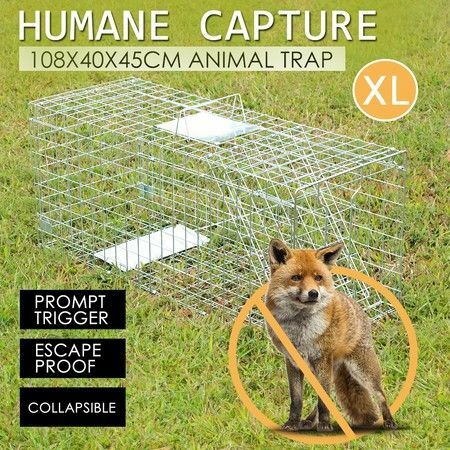 Catch the unwelcome animals in your garden or farmland with the humane animal trap cage. Crafted from a spring loaded door with automatic locking system, the possum trap delivers a safe, secure and quick catching process. Constructed in galvanized steel wire mesh, the cat trap is rust and corrosion resistant, durable enough to locate anywhere you want. Designed with smoothed internal edges, the rat trap ensures to keep the trapped animals from injuries. 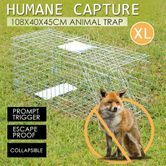 Perfect for capturing groundhogs, possums, raccoons, hares and other nuisance animals. The collapsible feature allows for easy storage while the protective carry handle makes it convenient and safe for transportation.